1- Can the same label be used for Canada and the USA? In a few rare cases, a single label may for both Canada and USA may be legally acceptable. This would be possible mostly for single ingredient foods such as fresh fruits and vegetables for which a Nutrition Facts table is not required. Although there are several similarities between the Canadian and US labelling requirements, several important differences remain. The nutrition facts table and the way to declare ingredients in Canada, for example, differ significantly from the US requirements. 2- How long will it take to review food labels for regulatory compliance and how much does it cost? On average, we require about 2 to 3 weeks to perform the regulatory analysis of a label. However, depending on the scope of the project, it may take more or less time. For a more accurate estimate of the time required to complete a specific project, please describe your project in the “Request a quote” page of this web site. 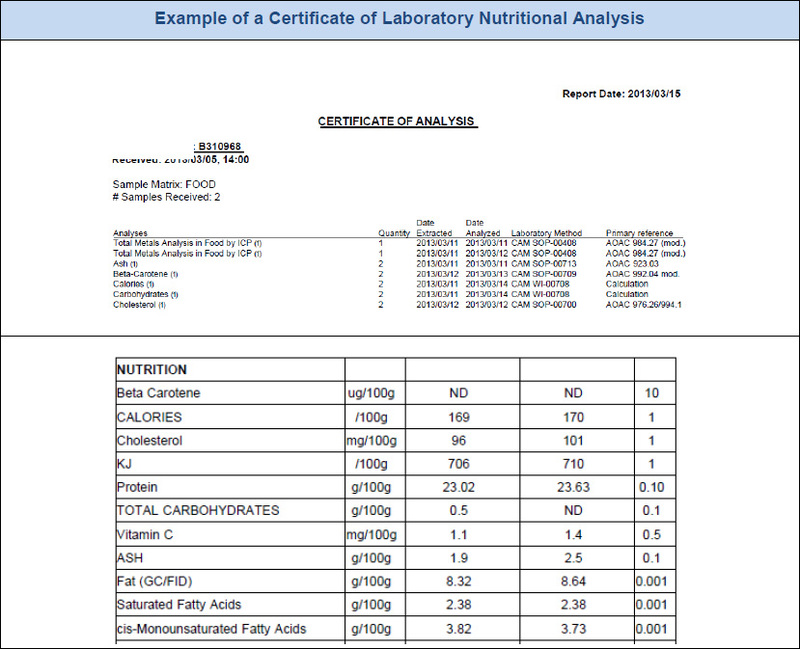 3- Are database nutritional analyses recognized as valid by the government for nutritional labelling purposes? Industry is responsible for ensuring that their nutrition labelling accurately reflects the nutrient content of their products. Database nutritional analysis is recognized as valid by Health Canada and the Canadian Food Inspection Agency when the method is deemed suitable to the product. Database analysis is not suitable for all food products. When the nutritional composition of a product is significantly altered by the processing method used, database analysis is not suitable. For example, deep fried food would not be suitable for database nutritional analysis as it is difficult to estimate the amount of fat absorbed during the frying process. Similarly, database nutritional analysis would not be suitable for food items for which the nutritional composition may be significantly altered due to processing methods such as sprouting and fermentation. 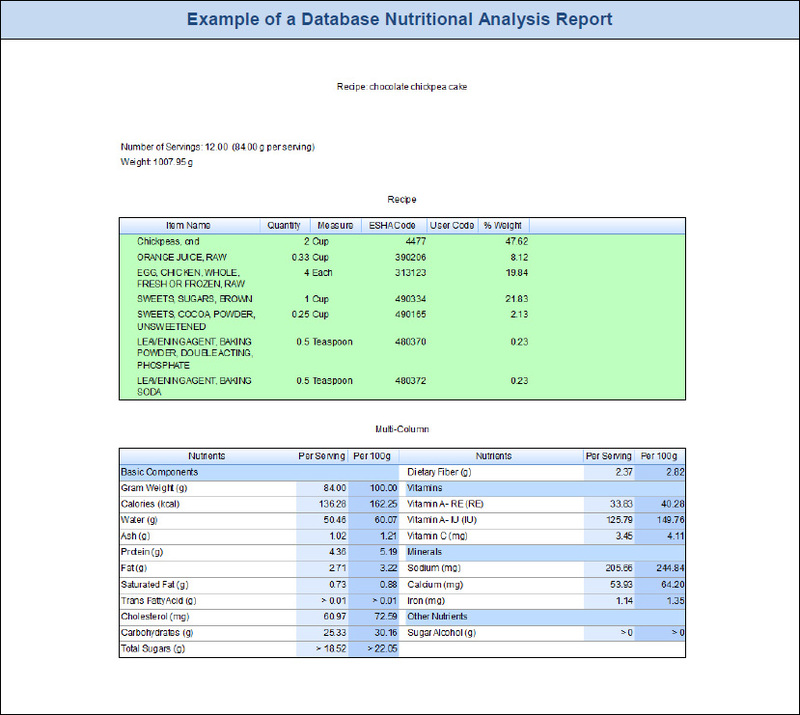 4- What information is needed to perform the database nutritional analysis of a food product? 5- What is required to produce a legally compliant Canadian Nutrition Facts table? The raw nutritional data (preferably per 100 g of product). The nutrition information must be stated with the degree of precision (i.e. same number of significant figures) corresponding to the methodology used to produce the data. Ideally, the certificate of laboratory analysis or the database analysis report should be presented (see examples below). The dimensions of the packaging (not the label portion only, but the entire packaging), as the Nutrition Facts table format depends on the dimensions of the packaging. Depending on the nature of the product and the marketing objectives (claims made on the packaging or in advertising), other information may be requested. 6- Is ACC Label a laboratory? interpret the results of laboratory nutritional analyses and use the data to produce legally-compliant Canadian Nutrition Facts tables. 7- Is ACC Label linked to the Canadian Food Inspection Agency, Health Canada or any other government agency? No, ACC is a private food labelling consulting firm offering regulatory, nutritional and linguistic advice. ACC Label is not linked to any government agency, other than by its obligation to abide by the law. 8- What is the advantage of consulting ACC Label’s nutritionists for my food labelling needs? ACC Label’s nutritionists master nutrition science , and the regulatory requirements of food labelling. It is their trade specialty. They analyze food products and food labels daily. As professional nutritionists, and members of the Ordre professionnel des diététistes du Québec, they constantly keep their knowledge up to date with a variety of continuing education activities. high work ethics and high quality standards. Choosing ACC Label nutritionists is choosing reliability!